Last week for Finance Fridays we were looking at how to deal with being refused credit. For this week we're talking about a type of loan you can take out once you have been accepted for credit. Years ago the personal loans market was much easier to understand as there were fewer products and types of loans you could apply for. If you found you had problems being accepted for a loan there was no real alternative options for you. Now the loans market has expanded to take into account the more complex nature of people's financial and personal situations. 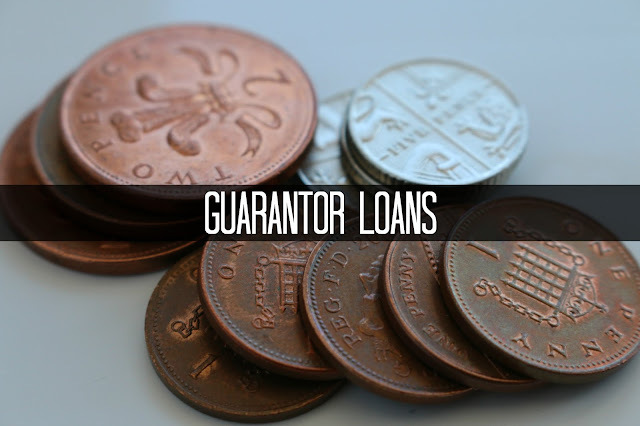 Let's have a look at one of those options known at guarantor loans. What is a guarantor loan? - If you find you have problems with your credit rating then a guarantor loan may be the solution for you. Rather than securing the loan with an applicable asset such as a car or property you agree with another person to guarantee repayment of the loan if you are unable to make the repayments. Usually this person will be a good friend or family member. Interest rate level - Due to the nature of guarantor loans interest rates can be higher than standard loans however they are no where near the level of 'pay day loan' providers. They are designed to be paid off over months and years rather than days. Rates typically range from around 39.9% with companies such as UKCredit and up to around 59.9%. Interest rates can often differ depending whether you and/or your guarantor are a homeowner or a tenant. Service fee – Some credit providers will charge a service or upfront fee when you take out a guarantor loan. This will be a percentage of the loan amount you take out. Obviously this could have a big effect on how much you have to pay and you could struggle with the initial payments. Always make you sure you do business with a company authorised and regulated by the Financial Conduct Authority (FCA) and are members of the Finance and Leasing Association. Being a guarantor – You can't be a guarantor for someone if you are already financially linked to them, therefore spouses, domestic and business partners are usually ineligible. As the guarantor you will need a good credit history to be accepted. Before agreeing to be a guarantor be aware of the financial responsibility you will be taking on. Ask the person who is taking out the loan why they need the money and show evidence of how they intend to make the repayments. As the guarantor you will be liable for any repayments and possible penalties if the loanee defaults on the repayments. Improving credit history – Guarantor loans are usually for people with poor credit history. If you do take out a guarantor loan and repay all the instalments on time it can be a good way to improve your credit rating as it shows you are now financially responsible. Have you ever taken out a guarantor loan? Would you act as a guarantor? If you want to join in with this week's Finance Fridays then add your link to the linky below. Any post concerning financial matters is allowed. Full details here. It doesn't have to be published today as you have until 23.55 on Tuesday 26th April 2016 to join in. Grab my badge below for your blog post. This is a hugely informative article! Many interesting points re guarantor loans. Useful information, thanks! I've heard of guarantor loans before but had no idea how they worked. Really interesting info, there really is so much research to do before jumping into getting a loan. I wouldn't want to be a guarantor for anyone, I am not even sure my kids are going to get me as guarantor! Those are still high interest rates aren't they - so I would only do it if I was in dire straits! I wouldn't want to be a guarantor for anyone . Your finance posts are always educating. Guarantor loans are a big responsibility for the person who chooses to be the guarantor. Also the interest rates are so high that one would need to be in a dire need to consider such loans. Gosh hard to ask someone to be a guarantor...or to be one. Great post with all the information.